Massillon (OH), United States – Midwestern Industries Inc. recently launched its Electro-Lift separator screen-changing system. The ergonomically designed lift system is electrically powered to assist in making separator screen changes easier, faster and safer. Engineered with a 120-volt sealed gear-driven system, operation is as simple as plugging into any convenient outlet and pressing a switch. The Electro-Lift is adaptable to fit a variety of different frame deck configurations. While it is designed to lift the frames of Midwestern Industries’ round separators, most makes and models of competitors round separators can easily convert to this system. The system’s ergonomically designed configuration assists with the lifting of separator frames to eliminate the need for two people to remove each frame – making screen changes virtually a one-man operation. Typically, screens must have hands on them when changing out. However, Electro-Lift is mounted independently to the frame so there is no need for it to be locked out when you are working under them with your hands. 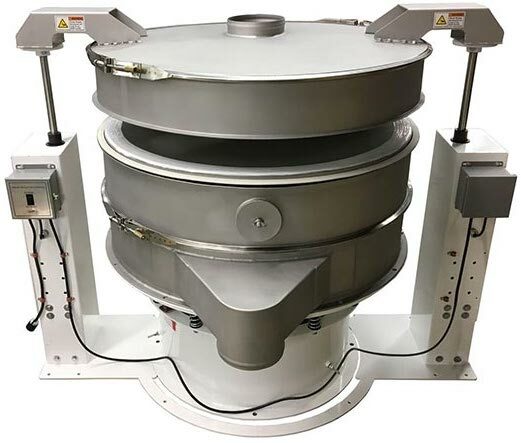 This engineering versatility also allows operators to change screens and gain access to the interior of the unit for cleaning or inspection, which is exponentially faster than using comparable systems. The system can also be used to inspect the screens to ensure quality control. Ultimately, the system changes screens faster with no lifting of heavy frames, which drives the Electro-Lift system’s key attribute of reducing downtime to a minimum. Safety is an integral part of the 120-volt Electro-Lift as it leverages a sealed gear-driven system, which ensures the frames will not drift down when changing your screens – even if the power fails. Unlike traditional hydraulic or pneumatic changing systems, if the power does go out during screen changes, the frames will not fall. Because the unit is 120 volt, it can be plugged into any convenient outlet, which eliminates the need for customers to provide compressed air. Midwestern Industries say that, whereas most competitive versions will use some form of clamping device if power is lost, Electro-Lift uses two mechanical screws powered by the actuator. Additionally, there are no cumbersome hoses to deal with, and the sealed system eliminates the need for greasing which makes it environmentally cleaner. Adaptable to multiple deck configurations. Faster screen changes help to reduce downtime to a minimum. Sealed gear driven system ensures safe screen changes every time. 120-volt electrical can be plugged into any convenient outlet. Frames will not fall or come down if power fails during screen changes.